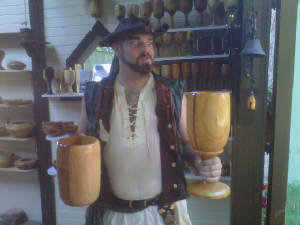 I just wanted to show you some pictures of the Michigan Renaissance Festival. It runs for 7 weekends in August and September. 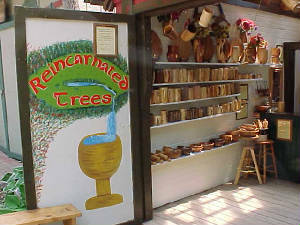 If you come visit us, stop at my booth, Reincarnated Trees, booth 614A. 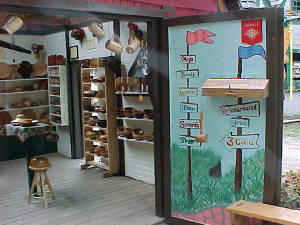 I am right between the Bakery (great cinnamon rolls) and the privies. May the winds always blow from the South East. When my cousins came to visit my lady wife joined us at the festival. 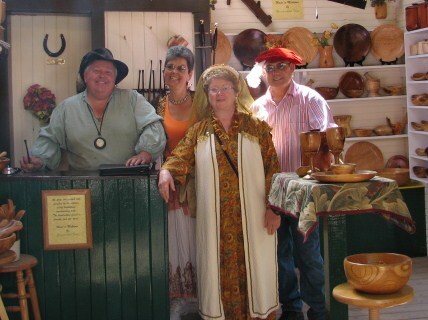 She's the lovely lady standing in front and bedecked in amber jewelry. Alice, Louann, and Patricia wanted to stop by and keep me honest. 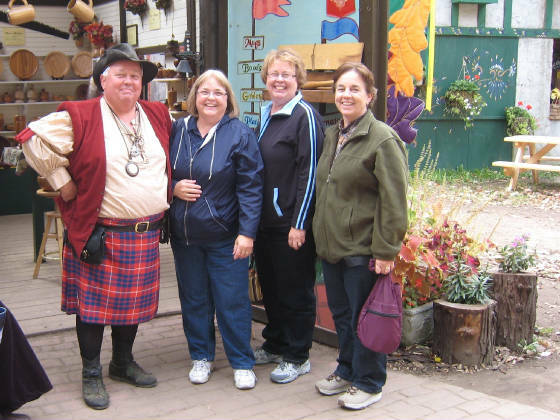 A great neighbor and the best kilt maker at this or any other festival. Click here to visit Angus at his site. Click here to visit Renaissance Fashions. Louie, married and moved up North, but still comes to visit now and then. Click to email Louie about his pens, bottle stoppers, bodice chillers etc. One of my favorite musical groups at the festival. A little rowdy, a little raunchy, lots of fun. Contact them for bachelor parties, divorce parties, wakes, and I'm sure they would also do Bar Mitzvahs. The Bawdy Boys wanted drinking vessels to suit their personalities. These hold a half gallon. There are many reasons to visit the festival. Most of the best reasons are in my booth, but I won't blame you for looking around. These items will range from $45 to $300. 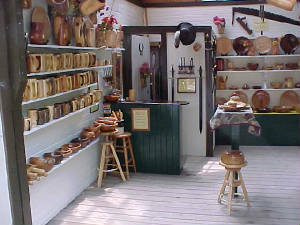 This displays a lot of the different items I turn. 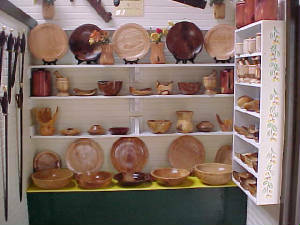 Bowls can range from $30 to $300 and goblets from $50 to $125. Special woods/orders cost more. 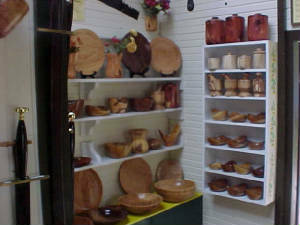 Maple, Cherry, Walnut, Ash, Oak, Black Birch, Catalpa, Ginko - Any Michigan wood can be a mug. Jo, who used to work the booth with me painted this and the other door. 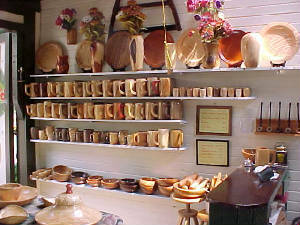 Mortar and pestles, containers, small turnings from $35 to $75. 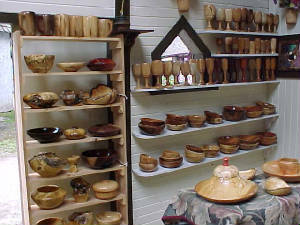 Goblets and bowls seen from another angle. 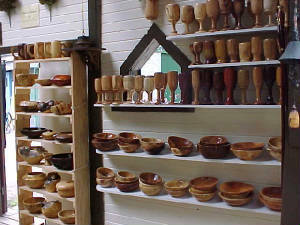 Mugs can cost $60 to $100 depending on wood and figure, special sizes or woods are extra. The other painted door. Jo does good work. The sign says Reincarnated Trees is 3 cubits away. I spend a lot of time defining a cubit.